Maps & Atlases (9PM Friday at Metro. $15, 18+) - So Many Dynamos and Sister Crayon open. 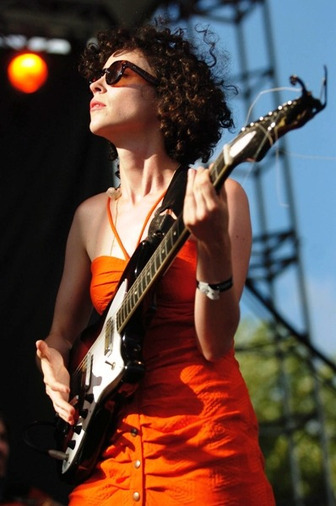 St. Vincent (7:30PM Friday at the Vic Theatre. 18+, SOLD OUT) - Shearwater opens. Andrew Bird (8PM Saturday at Auditorium Theatre. All Ages, SOLD OUT) - Mucca Pazza opens. Deals Gone Bad (10PM Saturday at Cobra Lounge. $10-13, 21+) - BomBBone opens. Grouplove (8PM Saturday at Metro. All Ages, SOLD OUT) - Reptar opens. Clutch (7:30PM Friday at Moejoe's in Joliet. $30, 21+) - MonstrO, HellYeah and Kyng open. Daughtry (7:30PM Friday at the Genesee Theatre in Waukegan. $53-63, All Ages) - Safetysuit and Mike Sanchez open. Eric Church (7:30PM Friday at Sears Centre in Hoffman Estates. $38-46, All Ages) - Brantley Gilbert and Blackberry Smoke. Jimmie Dale Gilmore (8:30PM Friday at the Montrose Room at the InterContinental O'Hare Hotel in Rosemont. $20-40, 21+) - Colin Gilmore opens. Kittie (9PM Friday at Austin's Fuel Room in Libertyville. $13, 21+) - Blackguard, The Agonist and Bonded By Blood open. Freedy Johnston (7PM Saturday at SPACE in Evanston. $18-30, All Ages) - Alison Scott also performs. Ralph Covert (8:30PM Saturday at the Montrose Room at the InterContinental O'Hare Hotel in Rosemont. $10-15, 18+) - Scott May and Thadeus Project also perform. P.O.D. (8:30PM Saturday at Austin's Fuel Room in Libertyville. $22-80, 21+) - Red, Brian "Head" Welch and Icon For Hire open.